Here we go with a rundown of top performers of late throughout the Phillies minor league levels. Statistics and standings are current through games on Wednesday. Outfielder Joey Meneses continues with his strong efforts for the 'Pigs. Among the league leaders in batting with a .304 mark, the 26-year-old Mexico native has 17 home runs and 55 RBI through 87 games. The righty batter was a free agent signing over the off-season. Left-handed starting pitcher Cole Irvin continues to rank among the top three in ERA this season in the International League with his 2.73 mark. Through 18 starts, the 24-year-old is holding opponents to a .233 batting average while posting an 8-3 record and a 7.5 K/9 mark. Since he was signed as a free agent this month, infielder Ryan Goins has tallied a .300 average with three doubles, a homer and two RBI. The 30-year-old veteran was a 4th round draft pick of Toronto in 2009. Outfielder Adam Haseley, the Phillies opening round draft choice last year, has performed very well since his promotion to Reading last week. The 22-year-old is batting .350 with two doubles, a pair of home runs and three RBI seven games. The lefty hitting Haseley put together a .300/.343/.415 slash line in 79 games with Clearwater this season. First baseman Austin Listi has enjoyed success at both Clearwater and Reading this year as well. In 27 games since his promotion to the Fightins, the 24-year-old right-handed hitter sports a .311 average with four homers and 19 RBI. Lisit was the Phillies' 17th round draft pick last year. Lefty hurler JoJo Romero has been outstanding since shaking off a rough start this season. The 21-year-old California native has notched 7-3 record along with a 3.01 ERA in 14 starts since April. 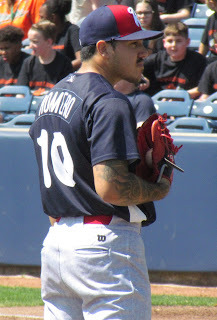 In four April starts, Romero was 0-3 with a 7.20 ERA. Overall this season, Romero, the Phillies' 4th round pick in 2016, has an 8.4 K/9 mark. Outfielder Mickey Moniak has had a noteworthy week. The 20-year-old has hit safely in nine of his last 10 games, launched a homer in back-to-back games and had his first multi-walk game of the season when he was issued three free passes on Wednesday. The three walks increased his season total by 33%. Infielder Grenny Cumana has been hot since returning from injury. The righty batting 22-year-old has posted a .370 batting average with five home runs, two homers and 10 RBI through 27 games with the Threshers. Outfielder Matt Vierling is off to a solid start in his pro career. After debuting with the short-season Williamsport team, the 21-year-old righty batter tallied a .420 average in 12 games there. He was soon promoted to Lakewood, where in 13 contests, Vierling is batting .289 with two doubles, a home run and three RBI. Vierling was the Phillies' 5th round draft pick out of Notre Dame this year. In 16 games this month, outfielder Jhailyn Ortiz has picked up the offense. The 19-year-old is batting .298 with four homers and 16 RBI through 16 games in July. The right-handed hitting Ortiz is a native of the Dominican Republic. Starting pitchers Will Stewart and David Parkinson rank 1st and 2nd, respectively, in the Sally League in ERA. Stewart, a 21-year-old lefty, is 7-0 with a 1.28 ERA and a .207 batting average against in 15 starts. Parkinson, a 22-year-old lefty, sports a 7-1 record with a 1.64 ERA and a .208 batting average against. Lefty reliever Keylan Killgore sports some remarkable stats through four pro outings. Since he was drafted in the 17th round this year, the Wichita State product has posted a 1.93 ERA and a .161 batting average against while striking out 13 and walking just two in 9 1/3 innings for the Cutters. Through five starts, lefty hurler Jhordany Mezquita has notched a 1-0 record with a 2.74 ERA while holding opponents to a .229 batting average against. The 20-year-old Dominican Republic native has struck out 25 while walking eight in 23 innings pitched to date. Shortstop Jake Holmes leads the Phillies East team in batting, sporting a .338 average. In 21 games, the 20-year-old righty hitter has notched four doubles, a triple, two homers and 18 RBI. Holmes was an 11th round draft selection last year. Luis Garcia leads the Phillies West team and is among the league leaders in batting with a .353 average. In 16 games, the 17-year-old shortstop had laced six doubles and driven in 16 runs as well. Garcia is a switch-hitting native of the Dominican Republic. 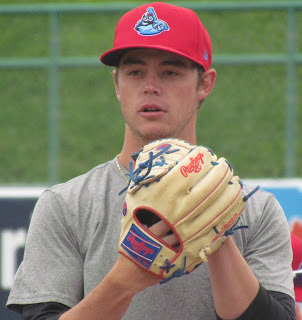 Righty hurler Ben Brown has looked very solid for the Phillies West team, posting a 2-0 record with a 2.25 ERA while striking out 29 and walking 11 over 24 innings in five outings (four starts). The 18-year-old was a 33rd round draft pick last year.